We’ve survived a long siege of fairly relentless heat this summer as July brought day after day of 90-degrees and higher, with humidity also pushing the limits. Some plants love the heat and are thriving, while others have passed the flowering bursts of spring and early summer and started setting seed or gone dormant. Among the plants that love heat and sun are some of the big pollinator-attractor flowers. 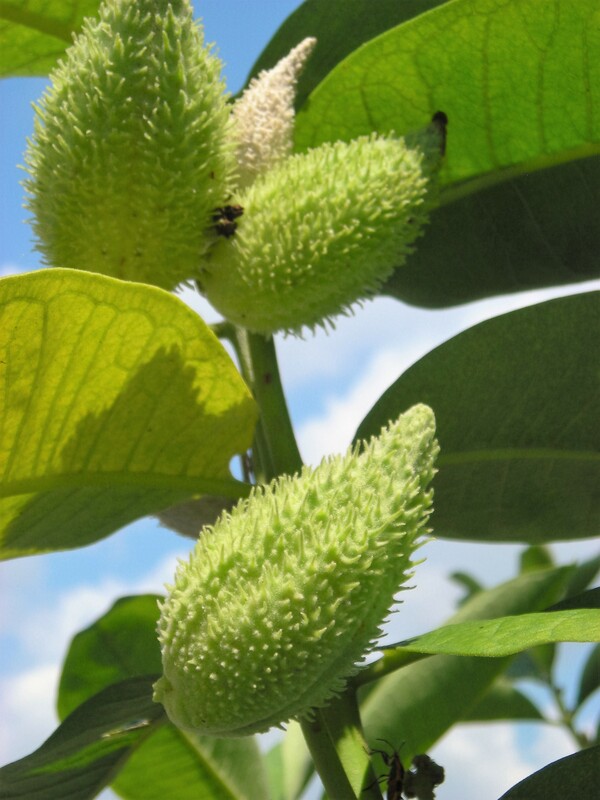 In this first week of August, the common milkweed (Asclepius syriaca) has finished blooming and is displaying those big pods that hold the seeds that will disperse in fall, little brown ovals floating on puffy white silk parachutes. The Joe Pye weed is not yet ready to bloom, but the swamp milkweeds (Asclepias incarnata) and the tall New York ironweeds (Vernonia noveboracensis) are approaching full flowering. One characteristic they share, besides being fairly to very tall, is that their flowers are carried on big, bright umbel heads, providing lovely landing platforms for the flying insects that feed on them. The big domed heads of summer phlox (Phlox paniculata) are also in full flower, as is the large clump of Chinese abelia (Abelia chinensis). Yesterday a large and beautiful swallowtail butterfly was feeding greedily, working its way through the abelia, darting about the high shrub branches too fast to be photographed. Also thriving in the heat and strong sun of high summer are the several varieties of silphiums with their varied heights and leaf shapes. All are impressively tall, yet for their height, the strong and hairy stems hold up masses of comparatively smallish yellow daisy-like flowers (silphiums are members of the Asteraceae family). While the perfoliatium variety (cup plant) holds a little water at the base of its leaves, they all attract bees, bee flies, wasps, and assorted other pollinating insects. Another prominent variety at Simpson is Silphium laciniatum (compass plant). Folklore has it that the compass plant’s leaves point north and south, enabling lost wanderers to orient themselves. Alas, science says that compass plant leaves are an unreliable indicator. 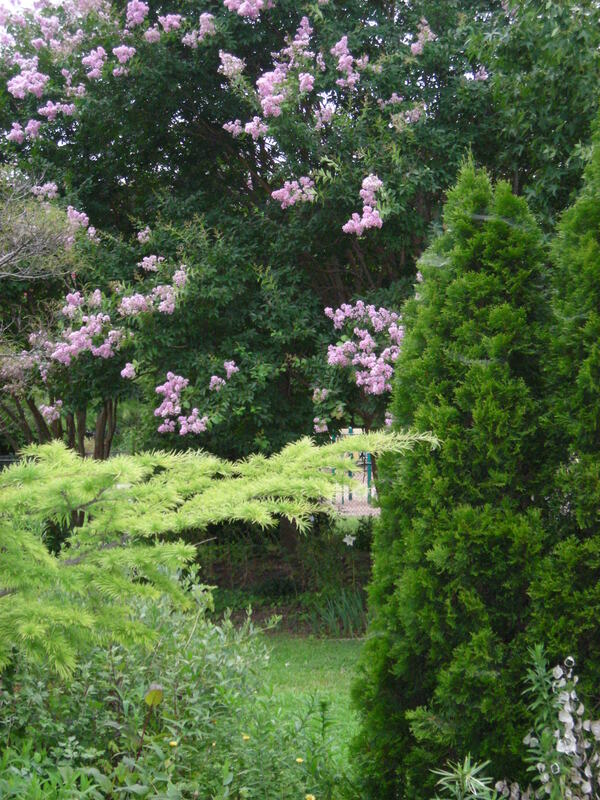 Garden Design: Golden larch (Pseudolarix amabilis, Eastern Srborvitae (Thuja occidentalis), crape myrtle (Lagerstroemia), and money plant (Lunaria annual). Visitors are welcome to come by anytime to see what’s in bloom. The next Simpson Open House is coming up in September, when the early fall flowers are usually at their peak. Check back for the exact date and come see our gardens in person. This entry was posted in MG in the Garden, Simpson Gardens and tagged Christa Watters, gardening, Master Gardeners of Northern Virginia, Simpson Gardens. Bookmark the permalink.